It is a reality that the circuit of Mexican festivals is increasingly solid and diverse, however, how many times have we not dreamed of the arrival of an international festival? For example, rumors of a Mexican version of Lollapalooza have been present in recent years, despite the little or virtually no information that can justify that hope. Another festival that has been rumored to arrive in Mexico is Sónar, a Spanish festival that since 1994 represents a total institution within the culture of electronic music and technology: the rumors have died, Sónar México is a reality! The dreamed team of live music in Mexico, made up of Ocesa, Sicario and 8106 announced the news that many of us were waiting for: the platform based in Barcelona is preparing to be deployed with everything on Mexican soil during 2019. What are we going to do until then? Well, there they also have us covered. It is about A Taste of Sónar , a party that promises to bring us into the atmosphere of the festival, a small but significant preview of what awaits us next year. 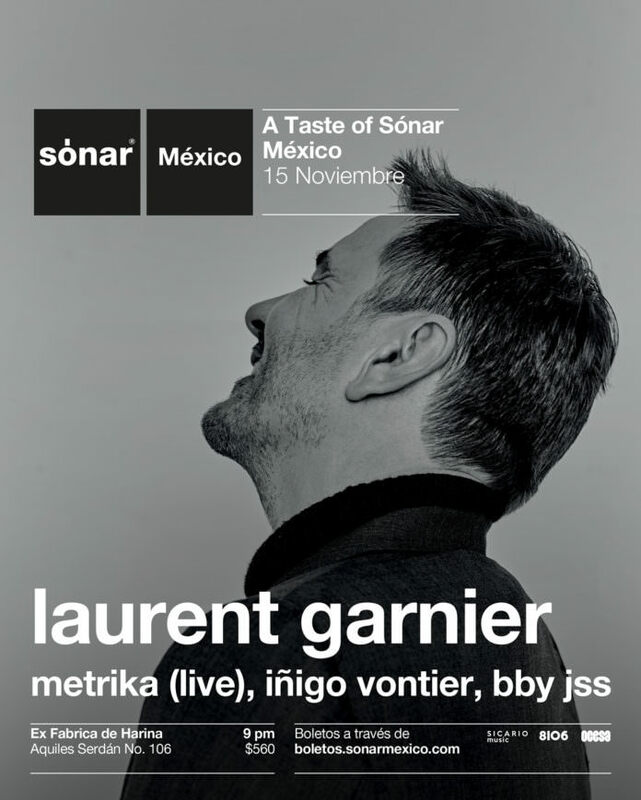 Significant because it will not be a night of any party, go no, because Laurent Garnier, the icon, the legend of the dance scene, will be the protagonist of a tremendous event. To talk about Laurent Garnier. Ironically, there are too many words. His work has been vital to understand electronic music and dance culture as we know it today, as it has influenced and empowered hundreds of DJs and producers not only of the French scene but also globally. And at 50 years of age, he has added three decades of a creative spirit and creator so powerful that he is able to reinvent himself within his very essence, getting a direct pass to the highlights of musical history. To know him, it is not enough to listen to his EPs and studio albums; out there is a whole planet full of ecosystems in the form of mixtapes, sets, live performances, concerts with orchestra and everything you can imagine, which is worth studying while enjoying and vibrating on the improvised track that can be any where you are right now. In addition to maestro Garnier, an eclectic selection of acts is added to the night. On the one hand, we have the capital Diego Cevallos, better known as Metrika, who has made a name and an important career as a DJ, producer and musician both solo and in groups such as Rey Pila. In its live version, not only will we listen to a refined set of house and techno, but we will see you in action as an alchemist of beats. He is also joined by the producer from Guadalajara Iñigo Vontier, a prodigy that has given flavor to the independent scene with its electronic productions that pick up exquisite tribal, tropical and autochthonous sounds. And to top it off, someone who at his young age has greatly nurtured the spectrum of Mexican dance culture, BBY JSS, which waves techno as his battle standard. A Taste of Sónar brings together precisely what the festival preaches: creative power, dance culture, innovation, tradition, local and international talent, good vibes and an experience that paints to be extraordinary. To make matters worse, the venue could not be more ideal, an abandoned factory that will wrap every beat and every movement to amplify them to the stratosphere. A must-see night to welcome an endearing festival, you have to be there! Here you can buy your tickets.